THE EMINENT HISTORIAN RICHARD BUSHMAN HERE REFLECTS ON HIS FAITH AND THE HISTORY OF HIS RELIGION. BY DESCRIBING HIS OWN STRUGGLE TO FIND A BASIS FOR BELIEF IN A SKEPTICAL WORLD, BUSHMAN POSES THE QUESTION OF HOW SCHOLARS ARE TO WRITE ABOUT SUBJECTS IN WHICH THEY ARE PERSONALLY INVESTED. DOES PERSONAL COMMITMENT MAKE OBJECTIVITY IMPOSSIBLE? BUSHMAN EXPLICITLY, AND AT POINTS CONFESSIONALLY, EXPLAINS HIS OWN COMMITMENTS AND THEN EXPLORES JOSEPH SMITH AND THE BOOK OF MORMON FROM THE STANDPOINT OF BELIEF.JOSEPH SMITH CANNOT BE DISMISSED AS A COLORFUL FRAUD, BUSHMAN ARGUES, NOR SEEN ONLY AS A RESTORER OF RELIGIOUS TRUTH. ENTANGLED IN NINETEENTH-CENTURY YANKEE CULTURE--INCLUDING THE SKEPTICAL ENLIGHTENMENT--SMITH WAS NEVERTHELESS AN ORIGINAL WHO CUT HIS OWN PATH. AND WHILE THERE ARE MULTIPLE CONTEXTS FROM WHICH TO DRAW AN UNDERSTANDING OF JOSEPH SMITH (INCLUDING MAGIC, SEEKERS, THE SECOND GREAT AWAKENING, COMMUNITARIANISM, RESTORATIONISM, AND MORE), BUSHMAN SUGGESTS THAT SMITH STOOD AT THE CUSP OF MODERNITY AND PRESENTED THE POSSIBILITY OF BELIEF IN A TIME OF GROWING SKEPTICISM. WHEN EXAMINED CAREFULLY, THE BOOK OF MORMON IS FOUND TO HAVE INTRICATE SUBPLOTS AND PECULIAR CULTURAL TWISTS. BUSHMAN DISCUSSES THE BOOK´S AMBIVALENCE TOWARD REPUBLICAN GOVERNMENT, EXPLORES THE CULTURE OF THE LAMANITES (THE ENEMIES OF THE FAVORED PEOPLE), AND TRACES THE BOOK´S FASCINATION WITH RECORDS, TRANSLATION, AND HISTORY. YET BELIEVING HISTORY ALSO SHEDS LIGHT ON THE MEANING OF JOSEPH SMITH AND THE BOOK OF MORMON TODAY. 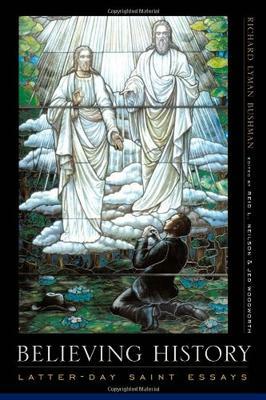 HOW DO WE SITUATE MORMONISM IN AMERICAN HISTORY? IS MORMONISM RELEVANT IN THE MODERN WORLD? BELIEVING HISTORY OFFERS MANY SURPRISES. BELIEVERS WILL LEARN THAT JOSEPH SMITH IS MORE THAN AN ICON, AND NON-BELIEVERS WILL FIND THAT MORMONISM CANNOT BE SUMMED UP WITH A SIMPLE LABEL. BUT WHEREVER READERS STAND ON BUSHMAN´S ARGUMENTS, HE PROVIDES US WITH A PROVOCATIVE AND OPEN LOOK AT A BELIEVING HISTORIAN STUDYING HIS OWN FAITH.